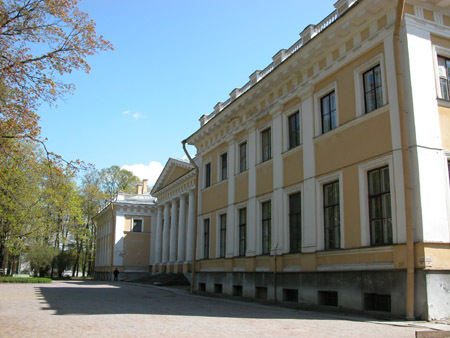 Hardly anyone of my acquaintance has ever seen the Kamennoostrovsky Palace from close quarters. 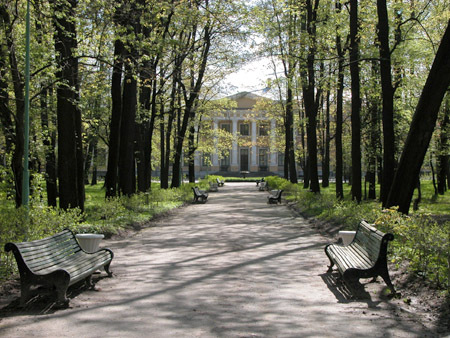 Tourist access is impracticable because the palace has been occupied by an Air Force health centre ever since the Soviet times. Only occasional adventure tourists have dared to trespass on its premises. 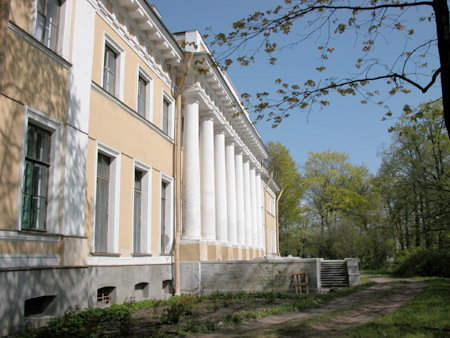 As evident by its name, the palace is located on the Stone (Kamennyi) Island, on the side opposite to the riverbank of dilapidated mansions and villas. The gates which permitted our entrance to the park are situated right behind the church of St John the Baptist (the red one, with a turret). 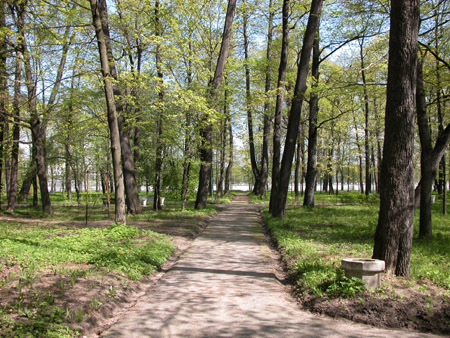 Having been laid out in a gridiron pattern in 1782, the palace park was subsequently redesigned by the architect Thomas de Thomon and by the master gardener Feodor Lyamin conforming to the latest fashion of natural gardening. I'm not certain if the original trees and park area have been preserved intact. Let's approach the palace along the alley. The Stone Island Palace had been erected from 1776 to 1781. 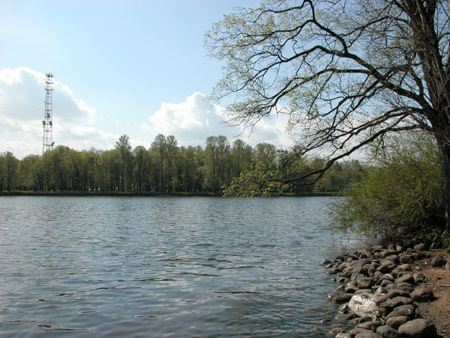 Building activity was temporary suspended due to the heavy flooding in 1777. Construction works were supervised by Georg von Velten and (after the inundation) by Giacomo Quarenghi. It's not clear who authored the original design. 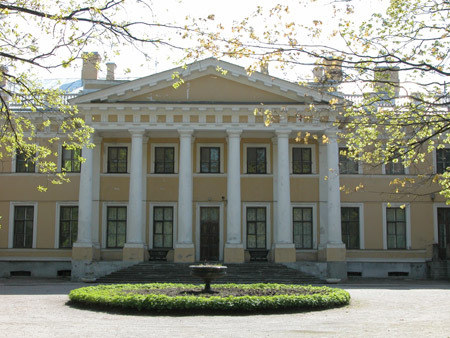 The palace was commissioned by Catherine II for her son and heir, Pavel Petrovich. 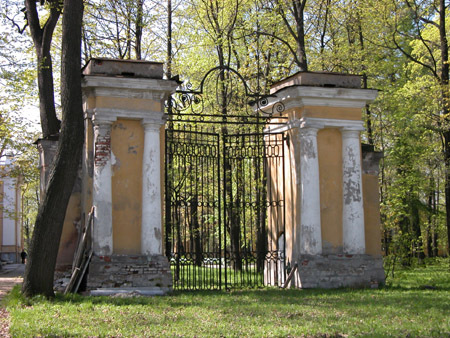 The Empress had granted the whole island to the tsesarevich as early as 1765. Pavel Petrovich was the future Emperor Paul. 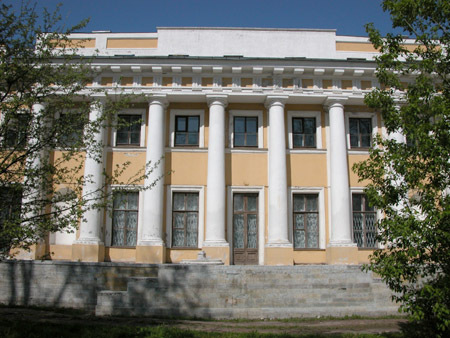 After his death the palace was reconstructed by Vasiliy P. Stasov. This sculpture seems to date back to the Soviet years. 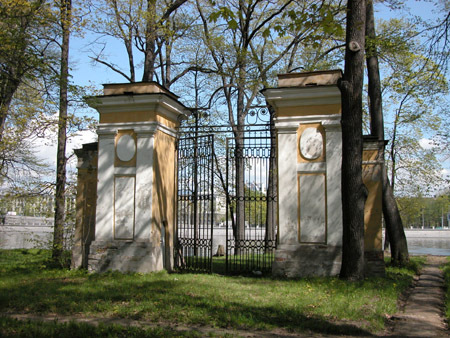 There are three or four similar gates around the palace, all designed by Georg von Velten. These ones lead to the Malaya Nevka. 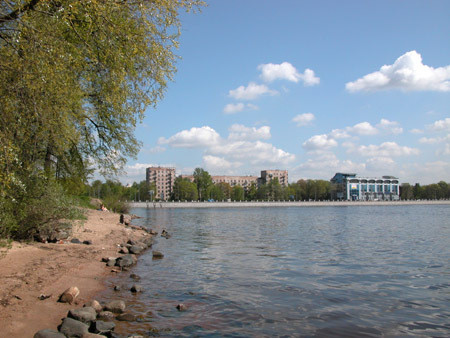 ...from the Malaya Nevka (rather, from the spit of Kamennyi Island). 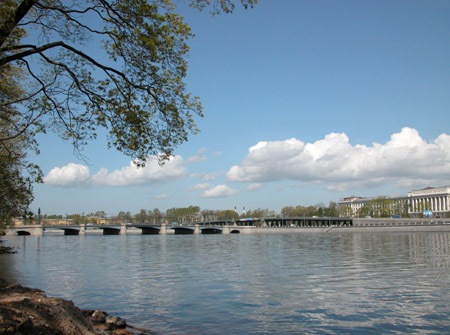 A view from the spit. A small sandy beach where somebody was sunbathing at that moment. 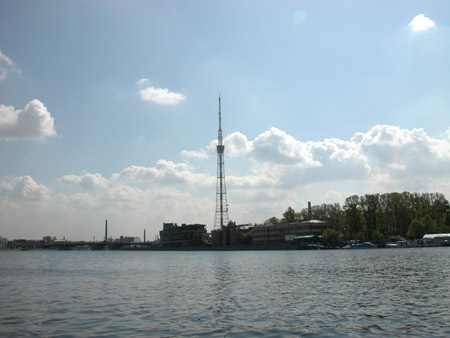 ...a view looking forward - at the TV tower. 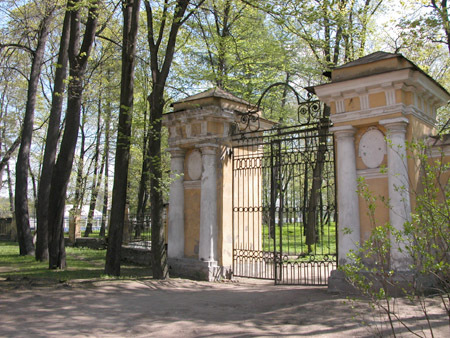 The Bolshaya Nevka gates are set apart from other structures. 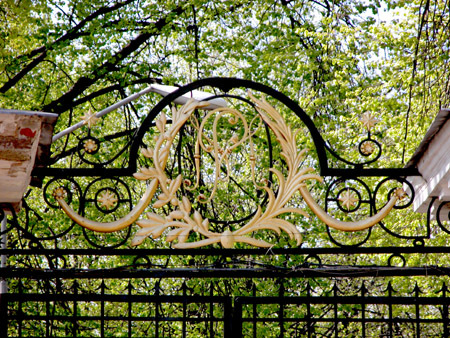 The same gates, from another direction. 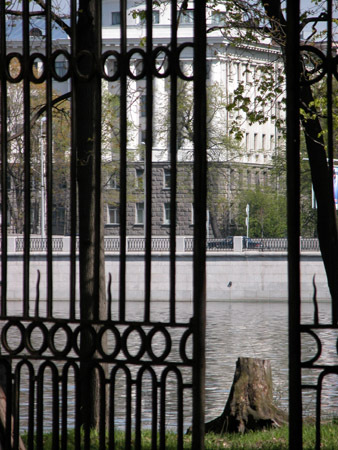 The gates used to lead to a narrow floating bridge, set up in 1781 to the right from the extant Ushakovsky Bridge. Here it is - the contemporary Ushakovsky Bridge. 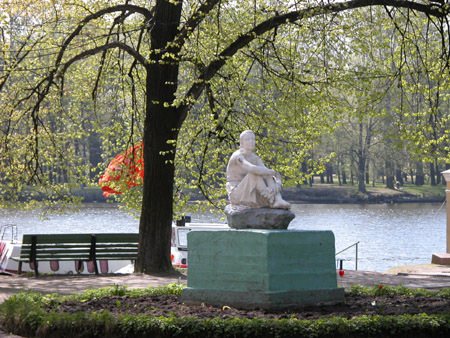 In addition, I submit to your attention another album from the retrospective series - "Piskarevo Memorial in 1961".